Ireland 2040 – A Framework for Public Investment? The Ireland 2040 National Planning Framework (NPF) currently under preparation, is tasked with providing a ‘framework for future development and investment in Ireland’ (Issues and Choices Consultation Paper). The consultation document makes clear that the NPF is intended to provide a high-level strategic policy document, working to coordinate the spatial aspects of a wide range of sectoral policies concerned with ‘housing, jobs, transport, education, health, environment, energy and communications’. The potential of strategic spatial policy to be provide a frame for the coordination of broad-scale policy objectives such as quality of life, prosperity and environmental sustainability and the development of place-based policy is explicitly addressed. It is evident that the NPF is intended to provide more than a reformulation of the politically-sensitive issue of balanced or effective regional development. It is also evident that it is not to be understood as ‘national plan’, prescribing where development should take place, as discussed previously on this blog here). Whereas the NPF will hopefully provide a central guiding framework for planning authorities, informing their decision-making and placing their work in a wider strategic context, this should not be understood as its primary function. The NPF is asking to be taken seriously as cross-sectoral overarching framework for investment, rather than treated as a national plan to be ‘implemented’ by local authorities. These strategic cross-sectoral policy coordination policy coordination objectives are to be welcomed. The current context of Brexit-induced uncertainty calls for open dialogue, cross-sectoral communication and strategic stakeholder engagement, as Ireland-UK and by default, Ireland-EU and North-South relations are simultaneously re-ordered and re-worked. Indeed, this period of uncertainty calls for spatial public diplomacy. The NPF can play an important function in this context providing in particular a framework for working out island-of-Ireland perspectives and reaffirming existing commitments to cooperation in matters of spatial planning and regional development on a North-South basis. The experiences of Wales and Scotland with strategic spatial planning furthermore demonstrate the potential of spatial strategies with strong cross-sectoral ambitions. The Scottish National Planning Frameworks build on a strong Scottish tradition of strategic planning and have played an important role as part of a broader ‘national conversation’ post-devolution. More importantly, they have served to focus policy attention on key projects of national importance and ‘spatial priorities for change’. The Wales Spatial Plan similarly was designed from the outset as an over-arching cross-sectoral framework, placing the work of the then newly established Welsh Assembly in a strategic spatial context and supporting joined-up thinking at a sub-regional level. In order to be taken seriously and to have relevance as a framework at a strategic policy level outside of the Department of Housing, Planning Community and Local Government, however, the NPF needs to be explicitly linked to public sector investment decision-making. The National Spatial Strategy was of course, designed to give spatial expression to the National Development Plan with the Gateway Investment Fund as the bridge linking spatial and capital investment planning. Unfortunately, the GIF was one of the first items to go when budgets were cut and the decentralisation fiasco characteristically served to make the worst out of a bad situation. We should nevertheless expect and demand that the NPF contain explicit commitments regarding major infrastructure projects of national and regional importance, aligning the spatial framework with national transportation policy and other key sectoral policies. Debate on the NPF should focus on concrete substantive issues of strategic spatial significance such as outstanding commitments under Transport 21, sustainable energy and climate adaptation policy and the future of the border region in a time of uncertainty. NPF scenarios could focus on the spatial development implications of infrastructure investments and policy choices, providing informed insights into possible regional development dynamics in Ireland 2040. This of course is based on the perhaps naive assumption that the Irish Government is prepared to commit public funds to strategic investment projects rather than relying on private sector investment. The NPF might also be expected to make funding commitments to support innovative regional development initiatives emerging from the bottom-up. It is possible to envisage a scenario where local authorities, business and community stakeholders could apply for capacity-building or small-scale investment funding on a competitive basis from funds administered by the three regional assemblies. Projects would be required to support the objectives of the NPF and to cross local authority boundaries, working with ‘functional territories’ in order to ensure strategic regional importance. Lessons can be learnt from urban-rural partnership programmes organised on a similar basis in Germany which have challenged metropolitan and rural districts to identify potential synergies and means of working together. Closer to home, the experiences of three Border Area Networks and work of ICLRD in developing common projects and strategies on a cross-border basis demonstrate the potential of this approach in the Irish context. It is time for a mature debate on the substantive issues the NPF can and should address on a cross-sectoral basis, and time for the Government to commit to public investment aligned with national spatial policy. Reminder: Submissions on the NPF consultation can be made until this Thursday 16th March (12 noon). The prelim results for Census 2016 make it clear that housing vacancy continues to be a serious issue in Ireland. Given that new housing units grew by only 18,981 to 2,022,895 and population grew by 169,724 to 4,757,976m between 2011 and 2016, one might have expected vacancy to have fallen substantially. However, housing unit vacancy fell by only 29,889 to 259,562. Of these 61,204 are holiday homes (HHs), a slight growth of 1,809 from 2011. On a base level vacancy of 6%, oversupply is 76,984. Vacancy and oversupply varies geographically as Map 1 demonstrates. 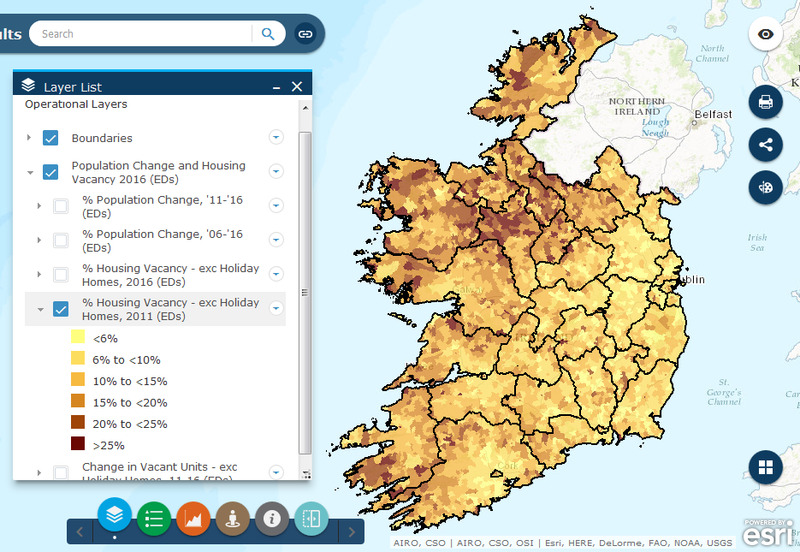 Excluding holiday homes all but three local authorities – South Dublin (4%), Dún Laoghaire-Rathdown (5.7%) and Fingal (5.3%) – having vacancy rates (exc. HHs) above base vacancy. In several cases housing vacancy (exc. HHs) is running above 10% and four local authorities have rates above 15%. The issue is particularly acute in the north west. One might expect that the vacancy rate has been declining everywhere, but this is far from the case. In fact, vacancy has been rising in many EDs. 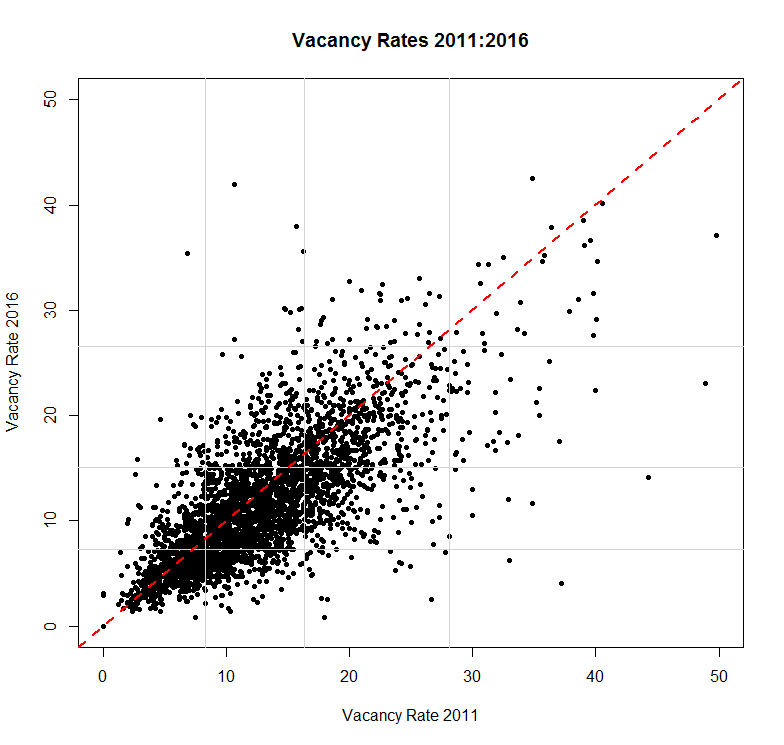 In Figure 1, each dot is an ED, with each dot above the line representing an increase in vacancy (exc. HHs). In some cases the increase is quite dramatic. So, the question is what has led some EDs to increase in vacancy? Some of it is obsolescence – in any housing market 3-5 properties drop out of use in a year. Some of it might be properties under-construction and on unfinished estates being completed (and thus counted) but are not yet occupied. And some of it will be related to population change and migration. Here, we want to look at the latter since a large number of EDs lost population between 2011-2016, especially those in rural areas (with towns in rural counties growing). 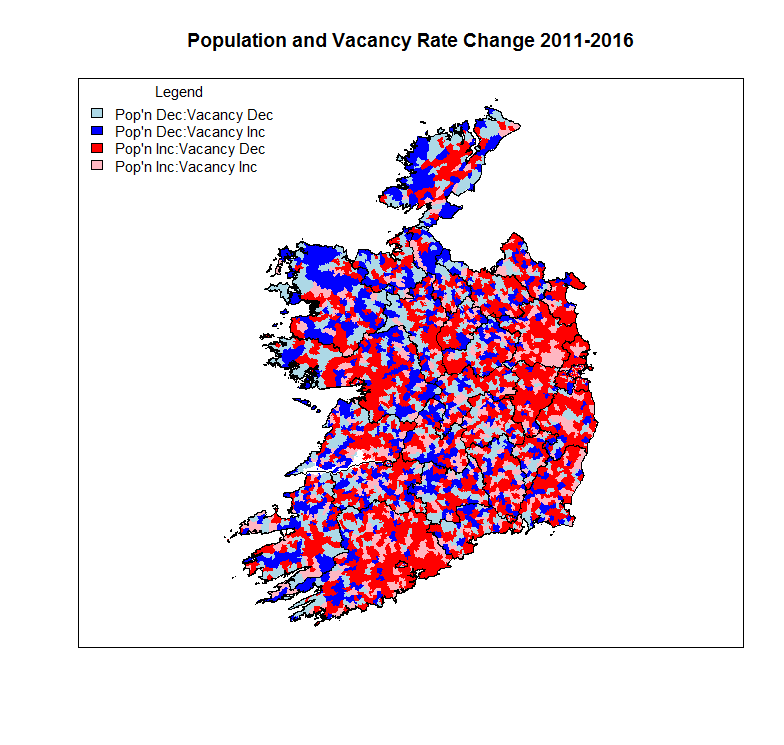 Map 2 shows population and vacancy (exc. HHs) categorised into four classes. The relationship we would expect would be classes 2 and 3 – where population decreased, vacancy increased, and where population increased, vacancy decreased. And that happens in 2022 EDs (out of 3406). However, in 1204 cases (c. a third), something odd happens: as population increases, vacancy increases (517 cases), or as population decreases, vacancy decreases (687 cases). In the case of the latter this might be explained by obsolescence and household fragmentation. We would be interested to hear of other possible explanations. Without further analysis it’s not possible to determine the causes of this inverse relationship. However, what the data does show us is that how housing vacancy is unfolding is not universal and there are different social and spatial processes at work. Below is the text of the talk delivered at the MacGill Summer School in Glenties, Donegal by Lorcan Sirr as part of a panel on the future of housing policy in Ireland. At a zinc bar in Granada, I pondered how I would reply to Dr Mulholland’s invitation to speak here. As I did, the barman was playing Led Zeppelin on the stereo, a song called ‘What Is and What Should Never Be’, and from this of all things I got my cue about how to discuss Irish housing policy. I’ve taken the liberty of changing it slightly as can be seen: what is, what should, and will never be. Ireland’s housing policy as it currently stands is a four page pdf document from June 2011 and one of those pages is a cover. It is called the ‘Housing Policy Statement’, a rather ambiguous title leading to confusion over whether it is actually policy or a statement about policy. Or indeed, just a statement. The Housing Policy Statement is notable for three things. Firstly, it reads as a form of mea culpa; an admission – if not quite an apology – of wrongdoing and a thinly veiled blaming of the previous administration’s approach. Secondly, through its analysis of the role of housing in the crash, it is a detailed checklist of what not to do in housing. Thirdly, it is more significant in being ignored and contradicted than implemented, which is somewhat ironic given its analysis of what went wrong. The most positive aspect of the policy is the idea of basing the future of the housing sector on the concept of equity across tenures. Sensibly, it also proposes that the housing sector should make an appropriate contribution to the economy, rather than be a driver of it. There are subsequent strategies of course, but these should emanate from the policy, so it’s policy that’s crucial. Although the economic role of housing (in job creation and asset wealth generation) is important, housing plays many more roles in Irish life. You wouldn’t know it from politicians, but housing is of critical importance in areas of health (and particularly mental health), in education, in human rights, in ageing, in quality of life and in general well-being. It is also deeply embedded with the concept of human dignity. We now have a good handle on the issues that we face, and which a housing policy should provide guidance in tackling. In terms of HOUSING, thanks to data from bodies like the Housing Agency, we know exactly how many houses we need and what locations we need them in. For example, we know that from 2014-2018 Clonmel will need 480; and the Dublin region will need 37,581 in the same period. This is significant step forward compared to previous housing practices where housing was provided with little or no regard to where housing was actually needed – the results of this crazy Late Late Show ‘one for everybody in the audience’ methodology can be seen in the ghost estates littering the country. We know that supply of land isn’t the total problem – there is plenty of land ready to be built upon – the issue is an ability and willingness to build. We know we need to achieve housing affordability, but not necessarily at the expense of standards – there is a concerted attempt to reduce standards mostly from people who ignore other costs, especially social costs. Our new-found ability to unearth uncomfortable evidence demonstrates that we have both an ageing population and a population with far more diverse household sizes (by 2018, nearly 60% of Dublin households will be one or two person, for example). So we know we need housing for people at difference stages of life and different household compositions: one-size fits all three- and four-bed semi D’s should no longer be the default position but yet are exactly what the industry is determined to build. Connecting all this of course is the issue of increasing the supply of both private and social housing for both sale and rent. And in addressing issues of supply, of course, we also address issues of affordability, which should be the key component of any housing policy. Relying on traditional methods of housing supply, construction and location will not bring affordability, however, but this is what we are doing. And Einstein had a quote for that: doing the same thing twice but expecting a different result is the definition of ‘not quite being at the top of the class’, to put it politely. Regarding the PRIVATE RENTED SECTOR, a housing policy should recognise the new importance of the PRS in Irish society. In a very short space of time, the private rented sector has sprung from obscurity as a refuge for students, immigrants and separated fathers, to occupy a prominent position and role in Irish housing. In 2015, just under 20% of households currently rent their accommodation. The PRS still provides refuge for students, immigrants and separated fathers, but its function and importance has expanded in line with issues surrounding access to credit, new work practices, affordability and the availability of social housing. The PRS additionally houses two new cohorts of renters: there are those who are actively choosing to rent, usually for reasons of quality of life. And then there are the multi-lingual, highly-educated, largely international workers in high-tech service industries such as Facebook, Oracle, AirBnB and, of course, Google. Affordability in the rental sector is now of economic importance because when rents rise one of two things happen: these bright young things will choose to go elsewhere to work, thus depriving Ireland of their potential taxable income; or if already here, their first concern is a pay rise to compensate for their expensive living costs (i.e. rent). The PRS therefore affects our ability to be competitive in a global marketplace. By implementing things like the long-awaited deposit retention scheme for tenants (20 years plus waiting), full mortgage interest relief for landlords (or at least incremental in line with the length of time a tenant has been in situ), secure occupancy (governments seem to think that a long lease equates to security of tenure; it doesn’t – unless reasons for termination are addressed then the length of a lease is meaningless); by creating the conditions for viable long-term renting; and generally treating being a landlord like a business, we can make renting an attractive prospect for both sides of the economic supply and demand equation – that is, landlord and tenant. We know we need to have and maintain high building standards, although when the self-build lobby jumped up and down the floor in the minister’s office reverberated and the government reacted immediately by proposing reducing standards which given our history of poor construction is a very irresponsible thing to do. There is no point in having standards if there is no inspection, however, and self certification causes more problems than it solves. Housing needs state building inspectors. We have more dog wardens than local authority building inspectors in Ireland, and given national and international building tragedies, we should not be attempting to scrimp on this (but we are…). The UK residential inspection rate is 100%; at our best we managed about 3%. We know we need to exercise more financial prudence with lending. However, the government’s first – and unfortunately predictable – reaction to the Central Bank’s lending restrictions earlier this year was to criticise them, and then try to help purchasers circumvent them. It begs the question: why have a Central Bank if this is what government does? Then there is also homelessness, asset-based welfare, and social housing delivery to be considered. Everything I’ve mentioned we can do, and we have lots of GOOD IDEAS to supplement these facts. The old hands-off leave-it-to-the-market ways no longer work. Methods of housing delivery, housing finance and housing typologies have moved on considerably since housing was last a driver of the Irish economy, and it is important not to revert to the laziest, lowest common denominator solution of a construction free-for-all which is currently what we’re heading for. Instead, by delivering housing by bundling parcels of land where 500-1000 private and social housing units are needed at a time, we can tender across the EU for housing construction using a body like the National Development Finance Agency who manage all state accommodation works, to control the specifications and delivery, and thus we can control affordability. Building 50-100 housing units at a time has its place in Ireland, but will make little inroads into real housing supply needs. And we’re not even thinking about new tenures such as temporal ownership whereby a property is bought via cash or a mortgage and ‘owned’ for a specified period of time (say ten years). Access to this housing tenure is easier and repayments more affordable than rent; and there is total secure occupancy for the purchaser. There are also things like community land trusts, and we could do with land zoned exclusively for long-term rental. So will this happen? Will we get a housing policy that addresses the real needs of housing in Ireland for the next half century, rather than the needs of those with access to the ministers? There are several reasons why I think we’ll struggle to produce a decent housing policy. Some of these are readily identifiable, and some are more obscure. The factors that are readily identifiable, I call ‘waves’. * a preponderance of poorly educated politicians compared to our European neighbours – at any one time c.30% of EU prime ministers will have a PhD: we have had one, ever. This is the easy stuff. Then there are the ‘undercurrents’ – or influential systemic issues – which flow beneath these waves. And here it’s interesting in that Ireland has more in common with southern Europe than northern Europe. For both southern Europe and Ireland the driving impetus has always been to protect, facilitate and extend home ownership. For example, the Housing Policy Statements’s drive for equity across tenures is ignored when the ability to buy a property is potentially curtailed by the Central Bank – the first response is to reach for the state cheque book to provide assistance. Like much of southern Europe, we have also managed to muddle along so far to meet housing needs without developing a strong social housing sector or especially a strong private rental sector. Most importantly, has been the strong conservative presence of the church. Across southern Europe and also in Ireland, particularly in the last century the church has been an advocate of the withdrawal of the state from collective provision, including housing, thus promoting reliance on the family or the church’s charities – for housing this has meant the provision of accommodation whilst saving for housing, the supply of land on which to build and the donation of finance to assist building or purchase. The responsibility allocated to the family and other charitable institutions in safeguarding individuals against social exclusion is significant. Assets from – and dependence on – the family are, in fact, a major source in filling gaps in the welfare and housing system (see childcare in Ireland for example). It has also meant a reliance on ‘patrimony’ – the distribution of wealth, often property – through family structures. The church has also been a strong advocate of home ownership (more for reasons of morality and preventing socialist tendencies than for improving housing stability), and an opposer of urbanisation and planning. And over many decades it has been a significant player in retarding the development of the welfare state since it viewed it as a competitor against its own welfare institutions. 2) Changing family structures (divorces, children outside marriage etc.) are challenging traditional patrimony. Separation in particular increases demand for housing but with lowered financial resources. An economic crisis also reduces individual means with which to afford housing. 3) The state remains at one remove from supporting those in need (individualisation of housing provision), especially regarding social housing leading to a lack of supply, and driving people into an under-developed rental sector. In effect, Ireland’s ‘spiritual’ home is with the other peripheral countries in southern Europe such as Spain, Malta, Italy and Greece, but its neighbours and recent ‘economic advisors’ are north European. And north European means high taxes for state provided services such as health, childcare, and education, and significant state involvement in housing provision, especially social housing. It also means a large functioning PRS and urbanisation. Housing in northern Europe frequently means the romanticisation of rural areas, which they do through protecting the countryside from development – definitely not conducive to one-off housing. There is less individualisation in most north European countries, less home ownership, less asset-based welfare and there is more social expenditure. So there is an ideological conflict between doing what our geographical and economic neighbours and occasional masters do, and doing what has been traditional in the Irish system. This traditional approach is now severely out of date though. With effectively two ministers for building and no minister for housing, the government is listening to those who shout the loudest rather than to those with most to say, and what has resulted to date is housing policy stasis. So, the obvious question is of course, what should be in a housing policy? A housing policy needs to be a plan for say 100 years (as in Portugal) centred around three principles – for example, affordability…delivered by efficiency, creating accessibility – with goals and targets. It needs to anticipate where and in what properties the average Irish person will be living in thirty years, how much of their salary they will be paying for housing, and the security they will have, whether renting or owning. Specifically, housing must be looked at as part of a broader, integrated national social and economic ecosystem: when was the last time you heard a minister for housing or the environment discuss housing in relation to education, mental health and welfare, childcare or road safety? Direct access to rural roads is a contributory factor in 15% of serious road collisions and fatalities, but you’ll never hear a minister for housing mention this because: a) they probably don’t know it; and b) even if they do, it doesn’t suit the narrative. Secondly, housing should be regarded as a critical part of the country’s infrastructure to ensure control of quality and location and to assess how it fits into the state’s other infrastructure. Right now there’s little control over this crucial aspect of our lives, with developers deciding what should be built and where – and they’re qualified to do neither. Finally, as we head for 2016 and the 2020s, it seems that Ireland’s housing policy is more akin to that of 1916 and the 1920s with overt political interference, an innate fear of urbanisation/densification and cities, and the continued dominance of a fundamentally rural ideology. We know the issues, we know the solutions – the question is do we have the political bottle to develop a housing policy that will last longer than five years and will efficiently deliver affordable and accessible housing for Ireland for the next hundred years. Article Published in the Irish Examiner, July 4th 2015. GREECE is being told to follow Ireland’s crisis solution of harsh austerity and acceptance of bank-and-bailout debt. This narrative conveniently ignores that the Irish ‘recovery’ has been built on major human rights violations and the undermining of long-term social and economic development. There is a dark side to Ireland’s ‘success’ that requires discussion about the most effective responses to financial and fiscal crises. The eight austerity budgets between 2008 and 2014 involved €18.5bn in public-spending cuts and €12bn in tax-raising (revenue) measures. Key public services, in particular health and housing, have been weakened as a result. Public service staff have been reduced by 10% (37,500). Health spending has been cut by 27% since 2008, resulting in an 81% increase in the number of patients waiting on trolleys and chairs in emergency departments. One-third of all children admitted to hospital suffering with mental-health difficulties have been put in adult wards and the waiting lists for youth mental-health services have increased to 2,818 people. Funding for local authority housing was cut from €1.3bn, in 2007, to just €83m, in 2013. This meant a loss of 25,000 social-housing units. This is a major contribution to the homelessness crisis, with 1,000 children and 500 families now living in emergency accommodation in Dublin. Because of the decision to prioritise bank recapitalisation and developer debt write-down, homeowner mortgage arrears have escalated. There are 37,000 homeowners in mortgage arrears of over 720 days, and legal repossession notices were issued to 50,000 homeowners. The cuts to welfare have had devastating impacts.Affected areas include lone-parent supports, child benefit, youth payments, fuel, back-to-school clothing and footwear, rent supplement, and disability and carers’ allowance. But charges were introduced where they did not exist before — putting a further burden on lower-income households. These charges are ‘regressive’, in that they were not tailored to income level. These include water, property, school transport, prescription, A&E and chemotherapy charges. Fees have effectively been reintroduced at third-level (increasing from €1,000 to €3,000). This will have major implications for participation rates from lower-income households. Funding for local community development, youth organisations, drugs prevention, family support, and to combat rural and urban disadvantage was disproportionally hit. Programme funding was reduced by 50%. We are likely to see the long-term social impacts of these cuts in the further exclusion from the labour force of youths in disadvantaged areas. Issues of drugs and crime will surely worsen. An EU report on the impact of austerity showed that the quality of secondary- and primary-level education has also been reduced, with fewer teachers, rationalisation of teacher/student support services, and the abolition of school grants. The report links early school-leaving to austerity measures, which are highly concentrated in low-income areas. This, along with the cuts in funding to third-level, will seriously damage our education system, the core of the country’s economic development. Hundreds of thousands of families and children have been pushed into poverty. The child-poverty rate rose from 18%, in 2008, to 29.1%, in 2013.The deprivation rate increased from 26.9%, in 2012, to 30.5%, in 2013, while for lone-parent families it has risen to 63%. Food poverty affects 600,000 (up 13.2%). Austerity has also devastated rural areas and small towns, with unemployment levels remaining much higher in the south-east. In one of the most disturbing pieces of research into the impact of austerity, UCC and the National Suicide Research Foundation found an increase in self-harm rates of 31% in men, and 22% in women, between 2008 and 2012, while the male suicide rate is 57% higher (that’s 500 additional deaths). They cited a number of factors, including reductions in public expenditure, cuts to welfare, substantial healthcare cuts, falling house prices and personal debt. Capital expenditure on important public infrastructure, such as hospitals, schools, roads, transport, broadband, water and wastewater was drastically reduced, by 60%, between 2008 and 2014. Such spending on infrastructure is the bedrock of sustainable and competitive economies, and the lost decade of investment in these will leave Ireland’s economy much more vulnerable into the future. Don’t forget, also, €17bn of our national pension reserve — which was available to fund infrastructure development and future pensions — was put into the bailout. The commitment by Irish governments to pay all the bank- and crisis-related debt will damage our long-term social and economic development, and result in ongoing crises in health, housing, and mental health, and in rising poverty and inequality. This is because funding that should be going to these much-needed public services will, instead, be going on debt interest payments. Debt interest payments rose from €2bn (3.4% of tax revenue), in 2007, to a staggering €7.5bn, or 18% of all tax revenue, in 2014. These interest payments will enforce a form of permanent austerity in the coming decade. Then, there is the often-forgotten issue of forced emigration. Almost 10% of Irish young people emigrated during the recession and emigration worsened as austerity intensified. It rose from 20,000, in 2009, to 50,000, in 2013. Without emigration, the unemployment rate would be 20%. Finally, almost half of Ireland’s dramatic increase in GDP is from multinational activity, which does not take place in Ireland. Thus, much of Ireland’s growth is based on facilitating some of the most profitable global corporations and financial services in reducing the tax they otherwise would have to pay to countries across the world. This is an unethical, unfair, and ultimately unsustainable form of economic activity. It is clear, as highlighted by a recent assessment by the Irish Human Rights and Equality Commission, that austerity hit the most vulnerable and marginalised the hardest in Ireland. But there was, and remains, a choice about how countries such as Ireland and Greece, and the Troika, respond to debt and financial crises. Debt relief is an important option, as is taxing the wealthy, financial services or higher incomes, rather than taking it from public services, the poor and middle-income earners. The Troika and Irish governments favoured the latter and we can see the human misery and economic damage caused, as a result. The Irish austerity-and-recovery model is being misrepresented on the international stage and should not be followed by Greece or other crises countries. The Irish case actually points to the human and economic necessity of debt relief and alternative approaches to fiscal crises. It is always useful to get a response to ideas and theories, and Prionnsias Breathnach’s reponse to our recent publications on rural Ireland will assist in furthering the debate on Ireland’s replacement spatial strategy. Our fundamental point is that any Irish Planning Region without a city is going to struggle, as exemplified with the two-tier performance of the recent severe economic downturn, 2008-to-date. With the State’s fragile spatial mass and absence of significant population centres, a future strategy for balance must recognise the need for ‘lumpiness’: not to control or stultify the GDA but in having the imperative and urgent need to grow the provincial cities to a size that substantially reduces the 2011 71% deficiency in its Zipf Rank Order Gini-coefficient deficit, wherein if Dublin = 100, Cork = just 17.5, Limerick’s 8, etc. As I have shown, this aggregate city population-shortfall is over one million. Successful implementation of EU Balanced Regional Development (BRD) is based on the underlying, necessary, assumption that there already exists a second tier of cities. Unfortunately, in Ireland’s (Republic) case and using George Zipf’s Rank Size Order Rule as the test, there is a conspicuous absence – a set of missing teeth – in not having in 2015, a range of 200,000 to 600,000 populated cities. Had Buchanan been implemented in 1969, by now both Cork and Limerick would have achieved these parameters. Bluntly, the absence of intermediate-sized cities makes the task of implementing BRD outside of the GDA as being unattainable; at least until such time as this pre-requisite exists. Accordingly, Lorcan Sirr and I are advocating that there is a pressing need for the replacement (new) spatial strategy to focus on developing at least one city or large urban centre in every Planning Region, which is capable of urban agglomerating. Alonso’s paper of 1970, (vide Balchin, 1995: 49) at Fig. 2.12, suggested an X-axis minimum city size of 100,000, with subsequent growth to its inflection points ‘C’, ‘D’ and with in-migration, to ‘E’. How much more so does the minimum threshold population of a modern Irish city need to be in this post-industrial ‘knowledge’ era, so as to reach a size, where it can capture the benefits of urban agglomeration growth, with its attendant clustering effects? It is encouraging to see the benefits of perhaps three specific ‘types’ of clustering in Galway City but this is altogether too few – Dublin has twenty-five or so types. Hence, Galway’s population can still be comfortably accommodated in the 82,500 capacity of Croke Park! anticipating in advance the emergence and recognition of new cities…e.g. the emergence of a sixth city with the impending agglomeration of Drogheda and Laytown-Bettystown-Mornington with a current, closing, gap of just 800 metres (Colp West to Donacarney): not 59 km, the distance between Athlone and Mullingar, a la the NSS ‘linkage’. The extended economic downturn for nearly the last decade has shown rural Ireland’s severe unemployment and enforced emigration vulnerability and the resultant two-speed economic penalty for regions without cities. Unfortunately, this is likely to be repeated during future cyclical downturns. Thus an all-island approach is needed to ‘lever’ the north-west to the City of Derry, to maximising the potential of the Dublin-Belfast Economic Corridor; to focusing growth on proven centres such as Portlaoise, where the land-use/ transportation interface is evident. Its 2006-2011, its population growth was equivalent to the aggregate of the NSS Midland Gateway of Athlone, Tullamore and Mullingar. Why select Monaghan, Tuam, Mallow, etc. ahead of Portlaoise? The ‘test’ for city-size thresholds would include locations that would be deemed suitable for ‘institutional-grade’ property investment locations acceptable to financial instruments such as Pension Funds, REITS, etc. Cities are a pre-requisite to economic ‘spillovers’. Recent Regional Studies literature has focused on the prospects for New Economic Geography and New Urban Economic research combining to provide urban modelling. Our wish is for their scientific advancement, to include evidence-based empirical modelling. With empirical tools which could incorporate demographics, thereby advancing the earlier ’industrial era’ approach to city threshold size. Such modelling would be of particular value to smaller countries including Ireland – states that exhibit strong major city ‘primacy’. One would wish for the new spatial and economic plan which is free of the harmful political ‘paw marks’ that bedevilled the 2002-2020 NSS, having perhaps fifteen or so nominated growth centres, limited to centres of 20,000 or more, with strong Daytime Working Population counts. Attempts to ‘twin’ or ‘treble’ linkages should be limited to locations that are already demonstrating urban agglomeration. The World Bank (2008) correctly advocated ‘lumpiness’ and centripetal agglomeration as the way forward, for developing countries, to build their cities, nurture the nature and change of ‘work’ and thereby benefit from the ‘knowledge’ economy world that now is. Spatial planning-wise, Ireland is a ‘developing, country, so get cracking!